First press the lids of Stampin' Up! Elegant Eggplant and Wisteria Wonder into the ink pads OR add a few drops of re-inker to the lids. Then spritz the glossy card stock with water, pick up some Elegant Eggplant ink with an aqua painter and spread it around on the card stock. Repeat with the Wisteria Wonder ink pad. Next sprinkle the card stock with salt and spritz with water again. Then allow it to dry either by air or use a heat tool to speed it up a bit. When dry brush off the salt crystals with either a towel or your finger and finish your card. Next stamp the koala on the 2" x 3 1/2" piece of white card stock in Stazon Jet black then watercolor it with an aqua painter and Smoky Slate, Pink Pirouette, and Elegant Eggplant inks. 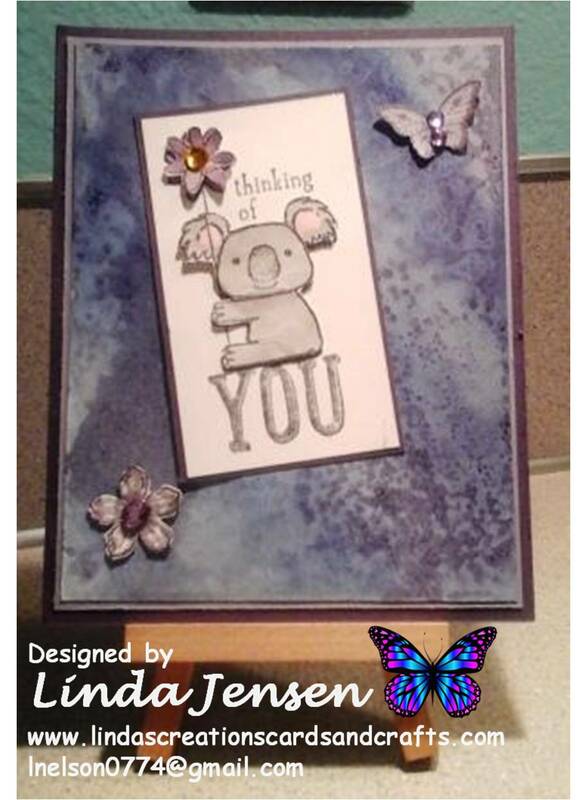 To create the 3D effect stamp the koala again on another piece of white card stock, cut it out then color it the same as the other one. Then attach it over the other one with mini pop dots. Next stamp the butterfly and flower on another piece of white card stock with stamps from Stampin' Up! Papillion Potpourri and Petite Petals stamp sets in Elegant Eggplant ink. Then watercolor the butterfly with Wisteria Wonder ink, punch it out with a Stampin' Up! Bitty Butterfly Punch and attach it to the front layer with a mini pop dot. Next cut out the flower and attach it to the front layer with another mini pop dot. Then attach the self-adhesive rhinestones, attach the koala to the 2 1/8" x 3 5/8" piece of Elegant Eggplant card stock then to the front. Next attach the front layer to the middle layer then to the base and enjoy!